Mullaleam is the 831st highest place in Ireland. Mullaleam is the most northerly summit in the Breifne area. Mullaleam is the second highest point in county Fermanagh. Mullaleam is the most northerly summit in the Cuilcaghs and a nondescript rise in the moorland, somewhat outshone by it's lower neighbour, Benaughlin. Approaching from the south, pass through the village of Swanlinbar, and on crossing the border, take your first left. At a T-junction take another left, passing a disused quarry. Continue past Gortalughany viewing point and park about 200m from the road's end, opposite a gate where a bog road crosses rough pasture (Grid Ref H164299 A). From here you're 2.3 km from the summit. The track peters out after 10 minutes, bringing you to the top of a gorge which a plaque describes as the Leggacurragh Valley. 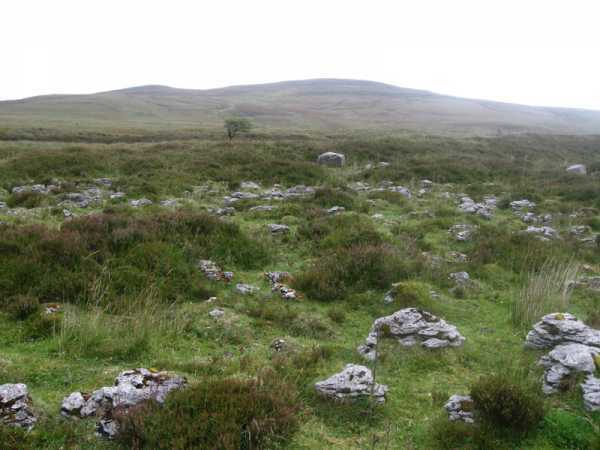 Burren-type limestone, and a succession of swallow holes make this an area of greater interest than you'd initially think.